Welcome to the Veenendaal - Veenendaal, formerly known as Dutch Food Valley Classic. A flat, but partly tricky parcours and the roleurs will love the fact, that we have crosswinds up to 35kmh today. The top sprinters should be the favorites nevertheless and so there's some pressure on Degenkolb, Ewan, defend race champion Cavendish or Guerao to deliver a big result in this HC race. 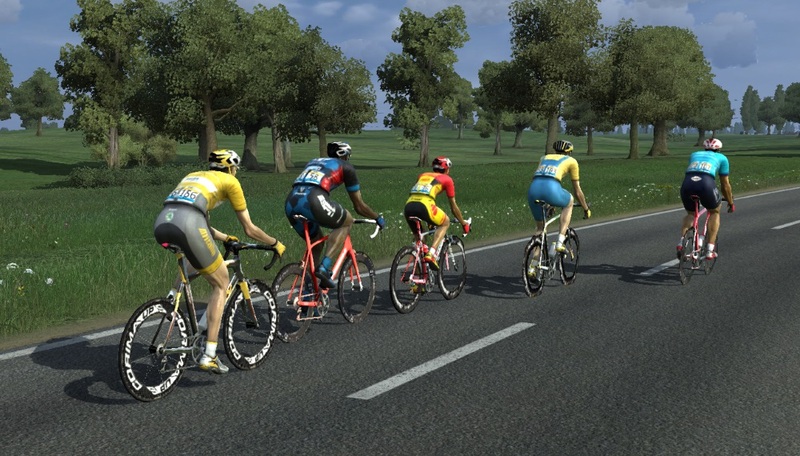 Strong roleurs such as Lander or Rowe may hope to upset the very best sprinters and of course the same goes for less strong sprinters like Ji, Baugnies or Vanbilsen. 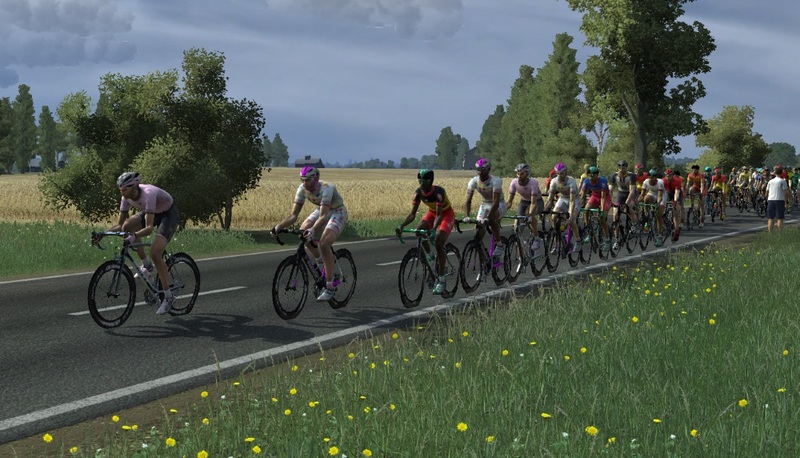 Delvaux, Podium, SPAR and also Iberia (at times) showing their colors in the chase of the early break, that is 3'53" ahead with now still 83km to go and the winds still up 37kmh at this point.. The field has now entered the finishing circuit, that has to be ridden a few times though: 37.5km to the finish, the early break leads by 1'41" and we see the next moves from outside the peloton! Østergaard tries to go clear! He couldn't though and with now teams like Iberia and Kraftwerk leading the chase, the early breakaway's advantage is down to 58 seconds with 26km to go..
Varga attacks at the same place where Ostergaard tried to go clear, just one lap later! Kvist, who simply punctured in the worst moment! Also Varga could not stay clear from the chasing peloton, that has not yet caught up to the early break though: 17km to go and the escaping group is still 50 seconds ahead! 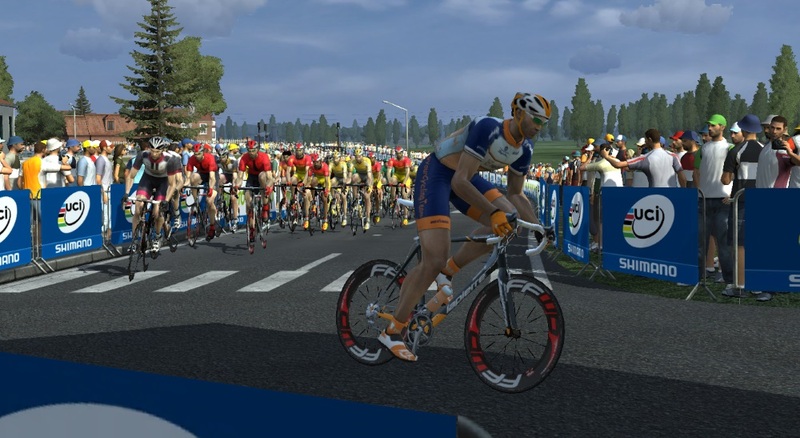 Kraftwerk and Iberia still as those teams leading the pack and Baugnies is the next rider to attack! Opposing to the other two attackers, Baugnies manages to bridge across the leading group, that is about a minute ahead of the peloton with now 15km remaining! Brockhoff and Gallego Martin prove to be reliable in this challenging race so far and Iberia finally looks in control of the race with now 10km to go and all escapees being swallowd by the pack (68 riders)! Neither Baugnies nor group Vanbilsen could stay clear..
Iberia now struggling to react and so Hermans rode to a 30 seconds advantage with now just 3km to the finish! Drapac a few positions behind..
Guerao another positions further behind..
1.8km to go for the peloton, that is still 37 seconds behind Hermans! Ji in the leading positon now, with Bennett right behind him! 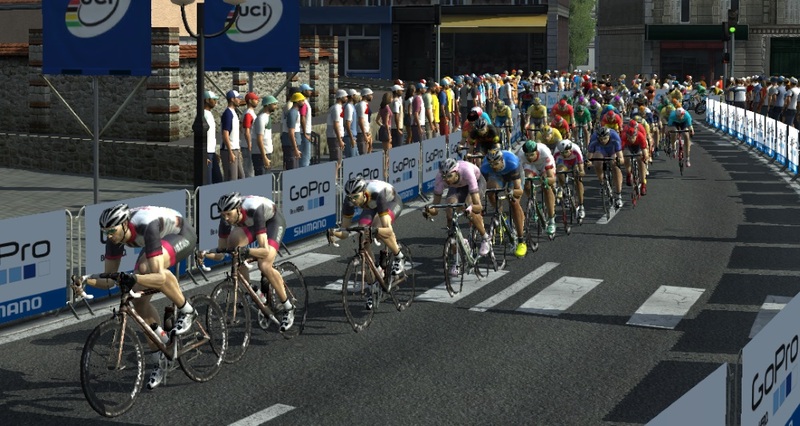 Rowe/Guarnieri/Serebriakov/Degenkolb/Goss/Cav building a train with Vanderbiest, Castaneda right behind them..
Ewan not looking too good, but Saber is catching up with Drapac at his wheel! Østergaard also moving forward again, just like Vanspeybrouck a few positions further behind! 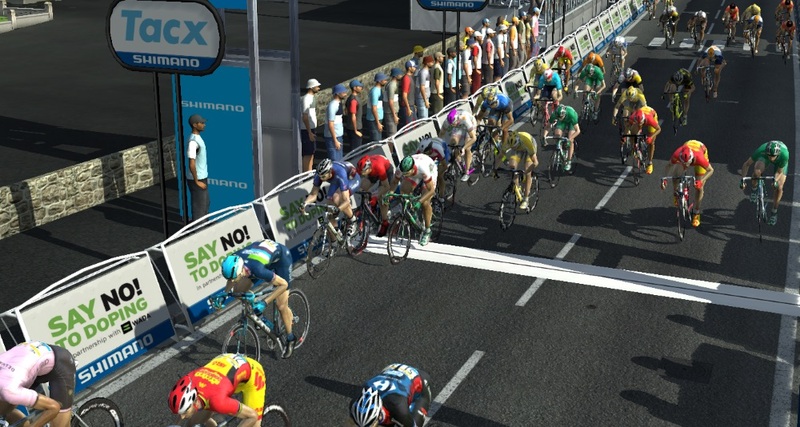 Hermans though too far away and he's approaching the finish with still a rather big gap on those others..
Ji and Maes still in the mix, but struggling against those sprinters now..
Bennett, Serebriakov ahead of Degenkolb, Ostergaard, Vanderbiest.. Guarnieri lost his good position, just like Rowe! 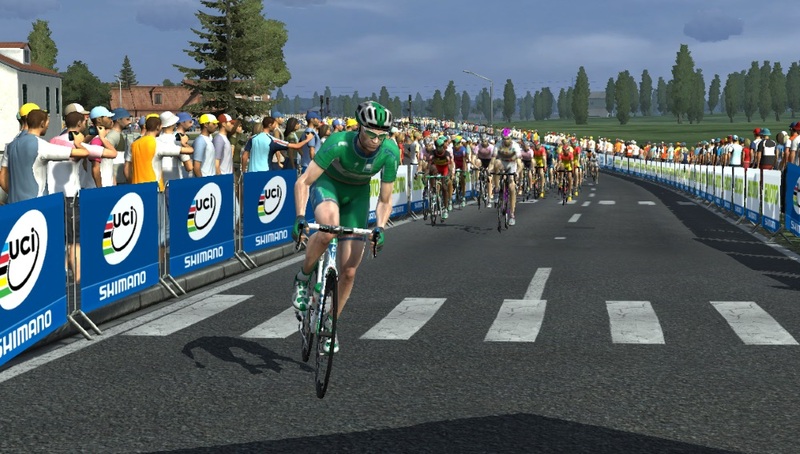 Guerao finally moving forward with some great speed.. Cav still behind Rowe..
Hermans celebrates his victory! Those races with crosswinds are just made for him and his attack from 5km outside the finish proved to be the decisive move today. Congratulations! 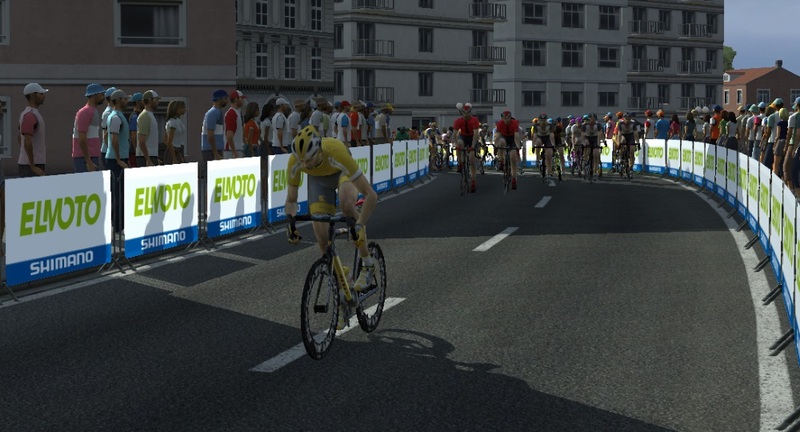 Serebriakov stronger than Bennett, but Degenkolb is coming closer on the final few hundres metres! Guarnieri also looking better now, Vanderbiest and now Goss with a small advantage though..
Guerao ahead of Rowe, Vanspeybrouck (Ostergaard collapsed) and Cavendish, who's boxed in though! 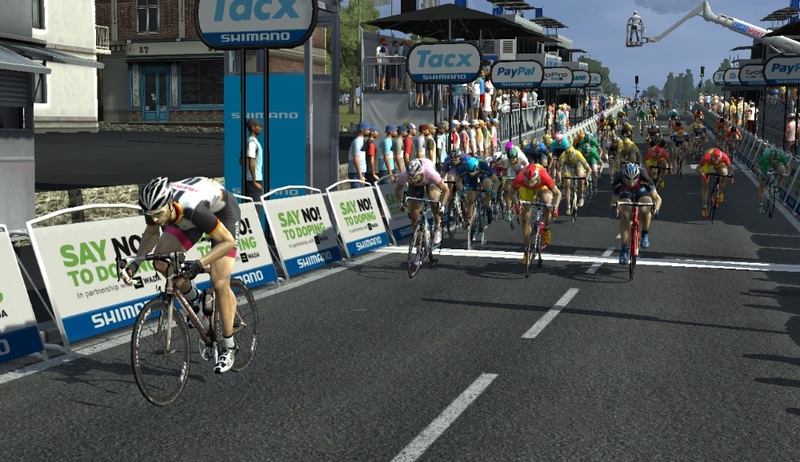 Degenkolb easily going clear from Serebriakov, who now has to hold off Guarnieri, Goss and Vanderbiest! Bennett still ahead of Rowe, Cav and Guearo, but significally losing speed now.. Castaneda, Ewan, Vanspeybrouck, Maes, Saber, Drapac and Ji on the further positions..
Degenkolb easily sprinting to a 2nd place! Not exactly the win, he was aiming for - but still a strong sprint and a solid podium..
Guarnieri takes 3rd ahead of Goss and Vanderbiest! 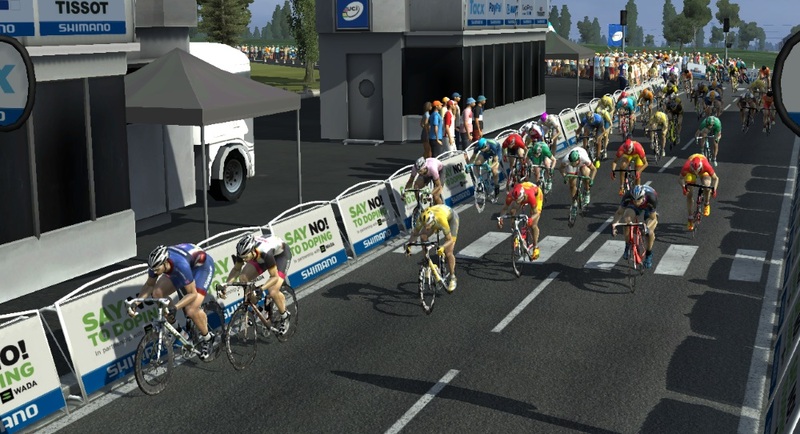 Rowe with a pretty good 6th place ahead of Serebriakov, who dropped a few places on those final couple of hundred metres..
Guerao 8th ahad of Cavendish and Castañeda! 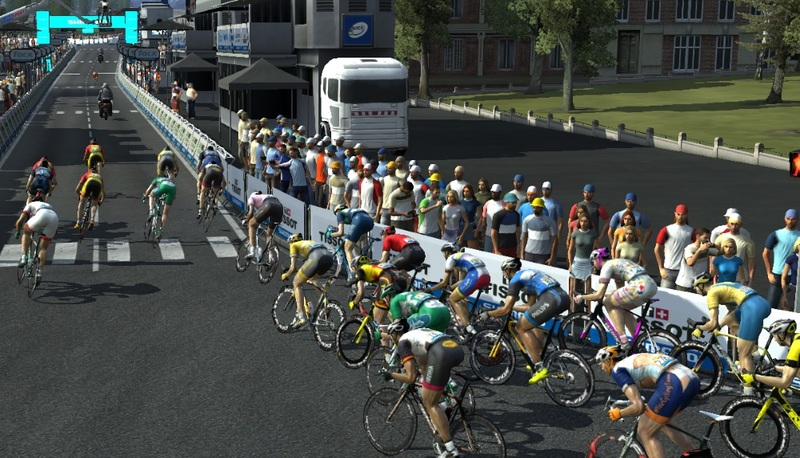 Not the best sprint from Cavendish and also Guerao can't be happy eventually. 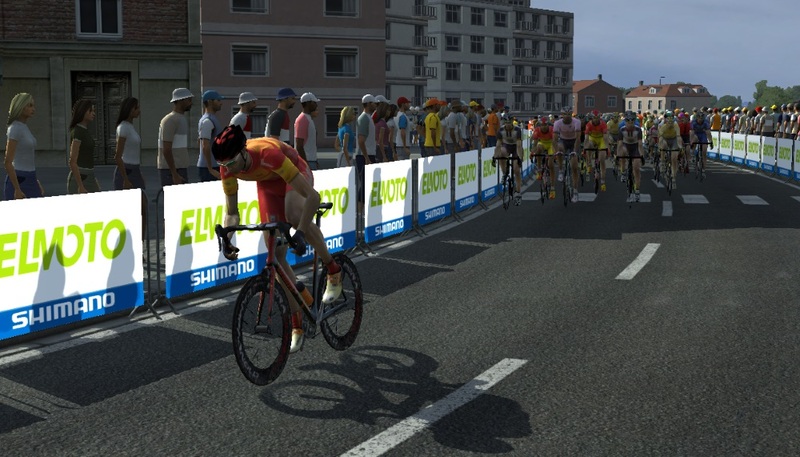 After missing out on a good position early into the sprint, he looked good for a while, but could not fight for a Top-5 result anyway..
Maes (11th) and Ji (15th) add some nice points for Indosat..
Vanspeybrouck with a rather surprising 12th place after his earlier attack did not work! 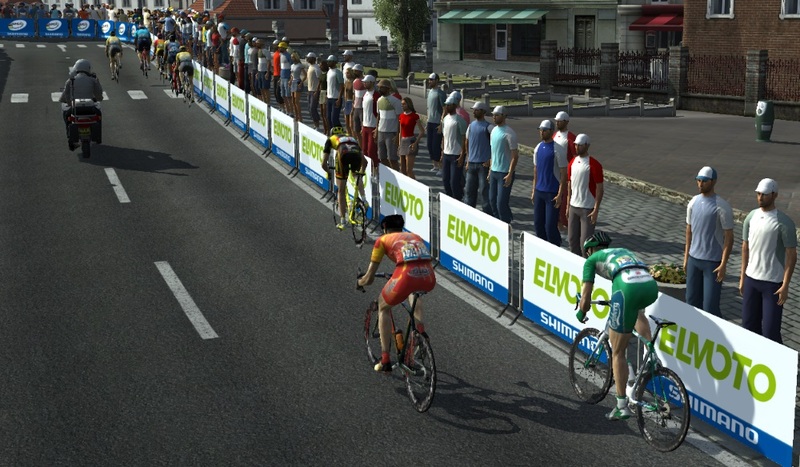 Bennett has to settle for a 13th place ahead of a disappointing Ewan.. also Saber can't be entirely happy with a 16th place ahead of Ostergaard, Langeveld, Drapac and Vanbilsen. Lander (21st), Stauff (22nd) and Moser (26th) with no Top-20 results then. 3 Jacopo Guarnieri Delvaux s.t. 4 Matthew Goss Indosat Ooredoo - ANZ s.t. 5 Romain Vanderbiest Carrefour - ESPN s.t. 6 Luke Rowe Xero Racing p/b Octagon s.t. 7 Aleksandr Serebriakov Novatek-Panarmenian.net s.t. 8 Óscar Guerao SPAR - Shimano - SCG s.t. 9 Mark Cavendish Kraftwerk Man Machine s.t. 10 Jaime Alberto Castaneda World Cycling Centre s.t. 11 Nikolas Maes Indosat Ooredoo - ANZ s.t. 12 Pieter Vanspeybrouck Carlsberg - Danske Bank s.t. 13 Sam Bennett Kulczyk - DMTEX s.t. 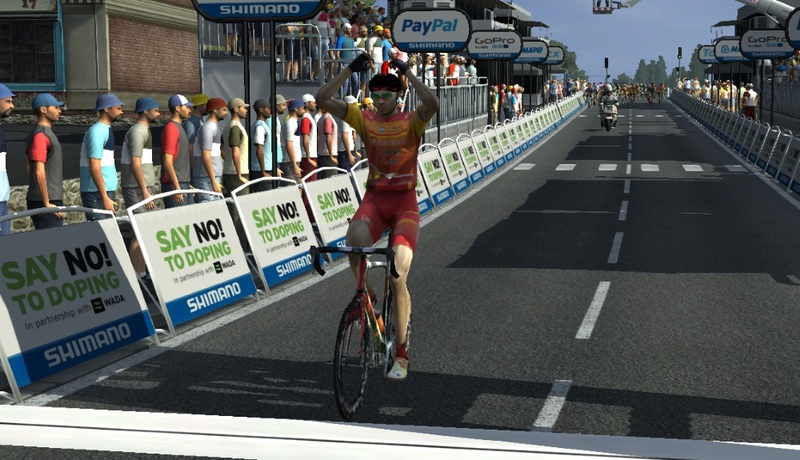 14 Caleb Ewan Podium Ambition s.t. 15 Cheng Ji Indosat Ooredoo - ANZ s.t. 16 Lahcen Saber Philips - Continental s.t. 17 Niki Ostergaard Carlsberg - Danske Bank s.t. 18 Sebastian Langeveld Kulczyk - DMTEX s.t. 19 Damion Drapac Minions s.t. 20 Kenneth Vanbilsen Lierse SK - Pizza Ullo PCTeam s.t. 21 Sebastian Lander Ayubowan! s.t. 22 Andreas Stauff cycleYorkshire s.t. 23 Jérome Baugnies Kulczyk - DMTEX s.t. 24 Asbjorn Kragh Andersen Carlsberg - Danske Bank s.t. 25 Peter Varga Team Reddit s.t. 26 Moreno Moser Euskaltel - Elior s.t. 27 Jimmy Pranata Indosat Ooredoo - ANZ s.t. 28 Ethan Weiss Azteca-NBCSN s.t. 29 Willie Smit Team Reddit s.t. 30 Elia Viviani Generali - EDF s.t. 31 Kevin Fouquet Kulczyk - DMTEX s.t. 32 Sameera Chatarunga Ayubowan! s.t. 33 Juan Abenhamar Gallego Martin Iberia - Team Degenkolb s.t. 34 Rafael Silva Generali - EDF s.t. 35 Nicolae Tanovitchii Generali - EDF s.t. 36 Edward Theuns Generali - EDF s.t. 37 Kevin Peeters Lierse SK - Pizza Ullo PCTeam s.t. 38 Jan Ghyselinck Generali - EDF s.t. 39 Sven Vandousselaere World Cycling Centre s.t. 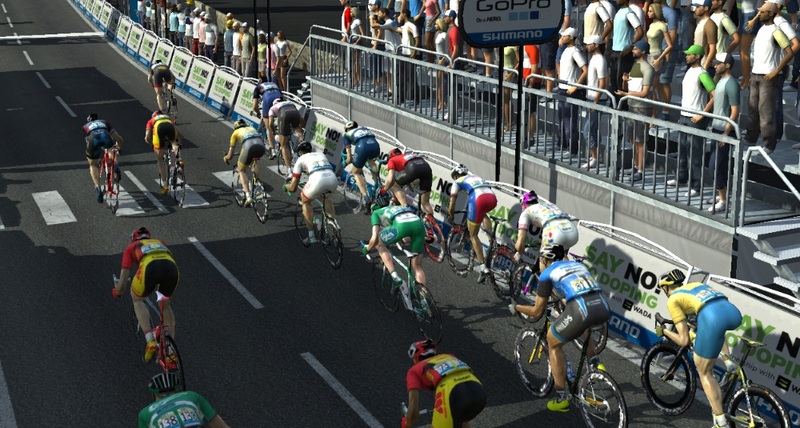 40 Yu Takenouchi cycleYorkshire s.t. 41 Roy Jans Iberia - Team Degenkolb s.t. 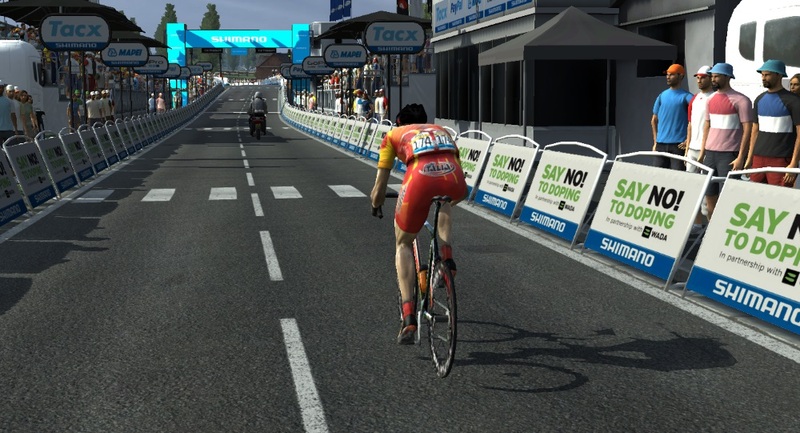 42 Geraint Thomas Podium Ambition s.t. 43 André Steensen Carlsberg - Danske Bank s.t. 44 Jenthe Biermans Lierse SK - Pizza Ullo PCTeam s.t. 45 Darren Matthews Podium Ambition s.t. 46 Marvain Tognama Kossouhorou Xero Racing p/b Octagon s.t. 47 Rasmus Tiller Carlsberg - Danske Bank s.t. 48 Kenny De Haes Minions s.t. 49 Ryan Mullen Kulczyk - DMTEX s.t. 50 Bart De Clercq Generali - EDF s.t. 51 Jan Brockhoff Iberia - Team Degenkolb s.t. 52 Joseph Areruya Xero Racing p/b Octagon s.t. 53 Jakub Kaczmarek Kulczyk - DMTEX s.t. 54 Roman Maikin Kraftwerk Man Machine s.t. 56 Michael Kurth Kraftwerk Man Machine s.t. 57 Abou Sanogo Carrefour - ESPN s.t. 58 Samuel Ssabagwanya SPAR - Shimano - SCG s.t. 59 Gediminas Bagdonas Iberia - Team Degenkolb s.t. 60 Carl Ngamoki-Cameron Xero Racing p/b Octagon s.t. 61 Daniil Fominykh Team Reddit s.t. 62 Kristof Goddaert Kulczyk - DMTEX s.t. 63 Ian Richardson Indosat Ooredoo - ANZ s.t. 64 Félix Emilio Besada Azteca-NBCSN s.t. 65 Kilian Frankiny Team Reddit s.t. 66 Jan Oelerich Iberia - Team Degenkolb s.t. 68 Hamish Schreurs Xero Racing p/b Octagon s.t. 70 Evgeny Russo World Cycling Centre s.t. 71 Abdelkader Belmokhtar Indosat Ooredoo - ANZ s.t. 72 Michel Kreder Delvaux s.t. 73 Guillaume Boivin Nordstrom - BioWare s.t. 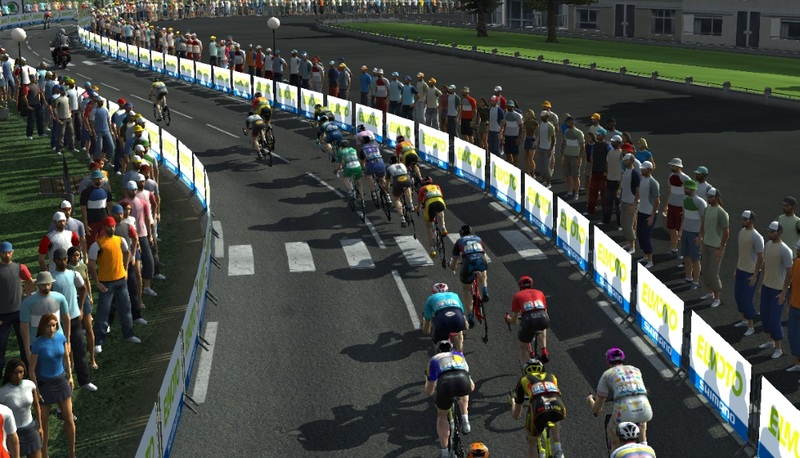 74 Issiaka Cisse World Cycling Centre s.t. 75 Romain Feillu Delvaux s.t. 76 Thomas Vedel Kvist Carlsberg - Danske Bank s.t. 77 Alvaro Hodeg Delvaux s.t. 78 Ahmad Arissol World Cycling Centre s.t. 79 Daniel Savini Lierse SK - Pizza Ullo PCTeam s.t. 80 Mektel Eyob Kulczyk - DMTEX s.t. 81 Evert Verbist Delvaux s.t. 83 Alexandr Nepomnyachsniy SPAR - Shimano - SCG s.t. 84 Remco Te Brake Philips - Continental s.t. 85 Mekseb Debesay Xero Racing p/b Octagon s.t. 86 Sarawut Sirironnachai SPAR - Shimano - SCG s.t. 87 Fernando Gaviria Lierse SK - Pizza Ullo PCTeam s.t. 88 Jay Thomson World Cycling Centre s.t. 89 Benoit Cosnefroy Euskaltel - Elior s.t. 90 Jamalidin Novardianto Xero Racing p/b Octagon s.t. 91 Fabien Grellier Delvaux s.t. 92 Andrew Fenn cycleYorkshire s.t. 93 Lucas Eriksson Delvaux s.t. 94 Robert Bush World Cycling Centre s.t. 95 Philip Lavery Generali - EDF s.t. 96 Mikhail Kochetkov Team Popo4Ever p/b Nemiroff s.t. 97 David Per Philips - Continental s.t. 98 Juan Martinez Azteca-NBCSN s.t. 99 Wen Hao Li Carrefour - ESPN s.t. 100 Anthony Turgis Ayubowan! s.t. 101 Shaun Nick Bester Team Reddit s.t. 102 Isaac Speirs Indosat Ooredoo - ANZ s.t. 103 Tesfom Okbamariam Indosat Ooredoo - ANZ s.t. 104 Scott Thwaites cycleYorkshire s.t. 105 Geert Van der Sanden Iberia - Team Degenkolb s.t. 106 Michael Faerk Christensen Carlsberg - Danske Bank s.t. 107 Kirill Pozdnyakov Novatek-Panarmenian.net s.t. 108 Kevin Feiereisen Carrefour - ESPN s.t. 109 Juan Jose Lobato del Valle Euskaltel - Elior s.t. 110 Faycal Hamza Team Reddit s.t. 111 Guillaume Van Keirsbulck Nordstrom - BioWare s.t. 112 Freddy Cruz Team Reddit s.t. 113 Ian Stannard cycleYorkshire s.t. 114 Alexandre Aulas Carrefour - ESPN s.t. 115 Mathias Krigbaum Carlsberg - Danske Bank s.t. 116 Metkel Kiflay Team Reddit s.t. 117 Oleksandr Polivoda Team Popo4Ever p/b Nemiroff s.t. 118 Bert-Jan Lindeman Minions s.t. 119 Max Walsleben Kraftwerk Man Machine s.t. 120 Jan Hopman Nordstrom - BioWare s.t. 121 Mamyr Stash Novatek-Panarmenian.net s.t. 122 Nihal Silva Ayubowan! s.t. 123 Westley Gough Kraftwerk Man Machine s.t. 124 Hsuan Ping Hsu SPAR - Shimano - SCG s.t. 125 Edison Bravo Azteca-NBCSN s.t. 126 Pedro Merino Criado Iberia - Team Degenkolb s.t. 127 Ashen Tharuka Ayubowan! s.t. 128 Andrea Pasqualon Novatek-Panarmenian.net s.t. 129 Laureano Rosas Minions s.t. 130 César Vaquera Azteca-NBCSN s.t. 131 Alexander Vlasov Nordstrom - BioWare s.t. 132 Willi Willwohl Kraftwerk Man Machine s.t. 133 Jay Major Minions s.t. 134 Lotto Petrus Philips - Continental s.t. 135 Bambang Suryadi SPAR - Shimano - SCG s.t. 136 Edwin Avila Minions s.t. 137 Chris Hamilton Team Popo4Ever p/b Nemiroff s.t. 138 Luke Durbridge cycleYorkshire s.t. 139 Christopher Lawless Podium Ambition s.t. 140 Mihran Avetisyan Novatek-Panarmenian.net s.t. 141 Enric Mas Euskaltel - Elior s.t. 142 James Piccoli Nordstrom - BioWare s.t. 143 Ajay Pandit Chhetri SPAR - Shimano - SCG s.t. 144 Getachew Sendeku World Cycling Centre s.t. 145 Piet Allegaert Philips - Continental s.t. 146 Martin Grashev Podium Ambition s.t. 147 Artem Topchanyuk Team Popo4Ever p/b Nemiroff s.t. 148 Nic Hamilton Nordstrom - BioWare s.t. 149 Jaoa Costa Philips - Continental s.t. 150 Martyn Irvine Kraftwerk Man Machine s.t. 151 Andriy Orlov Team Popo4Ever p/b Nemiroff s.t. 152 Kristian Vanderpool Podium Ambition s.t. 153 Kim Le Court Podium Ambition s.t. 154 Nawuti Liphongyu SPAR - Shimano - SCG s.t. 155 Borislav Ivanov Podium Ambition s.t. 156 Nils Politt Kraftwerk Man Machine s.t. 157 Alan Banaszek Carrefour - ESPN s.t. 158 Stelly Robert cycleYorkshire s.t. 160 Jhonatan Restrepo Carrefour - ESPN s.t. 161 Léo Vincent Euskaltel - Elior s.t. 162 Alexander Cowan Azteca-NBCSN s.t. 163 Thanawut Sanikwathi Carrefour - ESPN s.t. 164 Gabriel Cullaigh cycleYorkshire s.t. 165 Fabio Jakobsen Euskaltel - Elior s.t. 166 Nico Schinker Minions s.t. 167 Tadej Logar Novatek-Panarmenian.net s.t. 168 Ben O'Connor Team Popo4Ever p/b Nemiroff s.t. 169 Adam Roberge Azteca-NBCSN s.t. 170 Adam Toupalik Nordstrom - BioWare s.t. 171 Sepp Kuss Azteca-NBCSN s.t. 172 Adrian Nitu Team Popo4Ever p/b Nemiroff s.t. 173 Stan Dewulf Lierse SK - Pizza Ullo PCTeam s.t.